Engagement ring, normally presented to a woman by a man at the time of proposing marriage. It is worn on the left hand ‘ring finger’ and indicates that the person is engaged to be married. Sometimes, when the romance is already in the air, the couple can decide to get engaged without the romantic proposal by the men. Then, they may decide to buy each other engagement rings. 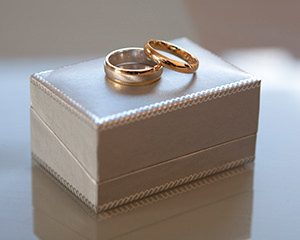 In some cultures, engagement ring is also used as wedding rings. Once, the engagement is announced to family, the excitement starts. There is normally a small engagement party within the family or the couple may choose a bigger celebration by hiring a venue and invite family and friends. Either way, their promise to marriage in now announced and every one waits for the big day. I, (name), take you, (name), to be my lawfully wedded (husband/wife), my constant friend, my faithful partner and my love from this day forward. In the presence of God, our family and friends, I offer you my solemn vow to be your faithful partner in sickness and in health, in good times and in bad, and in joy as well as in sorrow. I promise to love you unconditionally, to support you in your goals, to honour and respect you, to laugh with you and cry with you, and to cherish you for as long as we both shall live. Now, you have your engagement rings, wedding rings but more jewellery needed. Tiara, necklace, and earrings for the bride, brooch for the mother of the bride, gifts for the bridesmaids (necklaces, earrings). Don’t forget the groom’s present for the wedding; how about a watch or personalised cufflinks for the wedding day.